Heydon Prowse visits the small Welsh town that is starting a national tax revolt by copying the accounting techniques some big companies use to avoid paying corporation tax. For some of the UK's biggest companies, paying corporation tax seems to be optional. Using devilishly complicated - but completely legal - accounting techniques, they can run rings around HMRC. Now, the small businesses of one Welsh town are fighting back. 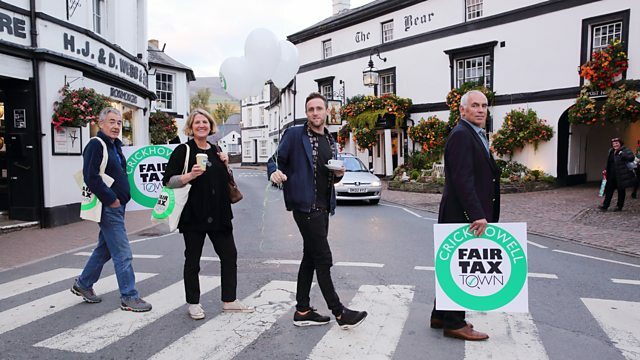 The local traders of Crickhowell in the Brecon Beacons are embarking on a mission to copy the techniques used by their multinational rivals, and to set up a DIY tax avoidance scheme of their very own. Presented by Heydon Prowse, co-presenter of BBC Three's The Revolution Will Be Televised, this film follows the owner of the local coffee shop, clothing stores, smokery, optician and bookshop of on their offshore mission. It is a journey that will take them to secretive tax havens, smart tax lawyers and even force a showdown with the taxman himself. Can they crack the secrets of the big tax avoiders and level the playing field for the small guy?